No need to have boring badges, let me dress them up for you! These are the retractable name badges worn by nurses and other health care people, as well as anyone who wears an ID badge for work or school. They are really cute done in school or college colors ... and they make great gifts and stocking stuffers! * Color of fabric: I have hundreds of different fabrics, so if you tell me what color you would like for your badge, I will pick something really cute! 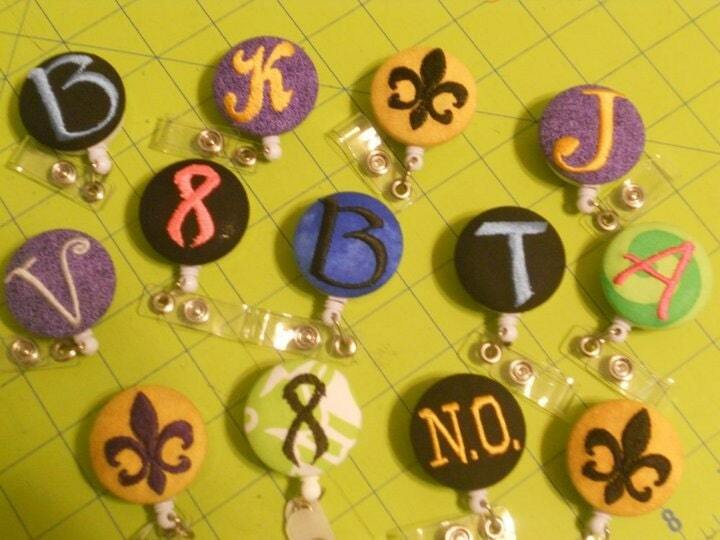 * Initial or Design: Fleur de Lis for New Orleans Saints, Mousehead, Superman, etc., or seasonal design, such as Candy Corn for Halloween, Heart for Valentine's Day, etc. We also have Cancer Ribbons in any color. This item is custom made so please allow several days once the order is confirmed for it to be made and shipped. You will receive email notification when the item is ready to ship. All of my items come from a smoke-free studio. Add me to your Favorites and you will be notified when new items are added.